Well, the first thing that you need to know about the way we feel is that we can’t help it. We absolutely can not help it. I have tried, and failed, to help it. It is unhelpable. That is the most important thing about the way we feel. .Today’s episode opens with Quentin Collins and Maggie Evans in the Collinwood drawing room, actively swiping right. They’ve come to the simultaneous conclusion that they’re young and pretty, and making out in public spaces would improve the world. Also, they each have a pitchfork mark on their hand — her right and his left, because that’s where the camera is — and that mark appears to be the on-switch for out-making. Coming up for air, Maggie voices a concern. “How did we get this mark?” she asks. “It must be some kind of punishment!” He gently grips her arms and tries to redirect, because every second that they spend on conversation is a waste of good kissing time. “Why did it appear on both our hands?” she continues, and he asks, “What does it matter what it means?” which as far as I can tell expresses the writing team’s attitude about almost everything. “Look at me,” he says, and she does. “I could never do that, and leave you here alone,” he counters. “You don’t want me to go, I know it.” She doesn’t. To be honest, they don’t really need an explanation for why Maggie suddenly has feelings for Quentin. We all have feelings for Quentin; we spent the better part of 1969 exploring them. But, as it happens, there is an outside force responsible for this close-order display of affection. Maggie and Quentin are under the influence of the witch Angelique, who’s cast a spell on them from outside the window, because she needs something interesting to do for a few minutes. She renounced her powers a while ago, but now she’s picked them up again, and this is practically the first thing she thinks of doing. Spell #1 was “stop my husband from killing me,” and then this was next on the list. Now, Angelique has spent the last several weeks trying to convince us, her friends, and most of all herself, that she was madly in love with Sky Rumson, an attractive publishing magnate with secret Cthulhu mob ties. Sky just broke up with Angelique, thrusting a burning torch in her direction to make his point, and obviously, she was devastated and heartbroken. This lasted for five and a half minutes, not counting the commercial break, and then she came to the conclusion that she really belongs with Barnabas, a revelation that she experiences every six months, whether she needs to or not. So imagine her displeasure when she returns to the Collinsport area and discovers that Barnabas is in love with a Kathryn Leigh Scott character, for the fourth time in a row. Over the last few weeks, Barnabas and Maggie have been gently drifting into an understanding, which may turn into a passionate love affair if they can muster up the energy for it. Offended, Angelique casts a nefarious spell, pairing up Quentin and Maggie without their consent. This is an intriguing story development that makes next to no difference to anything over the next five weeks. The current clinch will end, as clinches do, and the lovers will part, and then we won’t hear anything else about it for a couple weeks. Two Fridays from now, they’ll use this love connection to resolve a cliffhanger, and Quentin and Maggie will kiss again. A couple weeks after that, they’ll get another moment together, which keeps Quentin out of the way of a minor plot point, and that pretty much wraps it up for these two. For her part, Angelique appears three more times between now and the end of the current storyline. 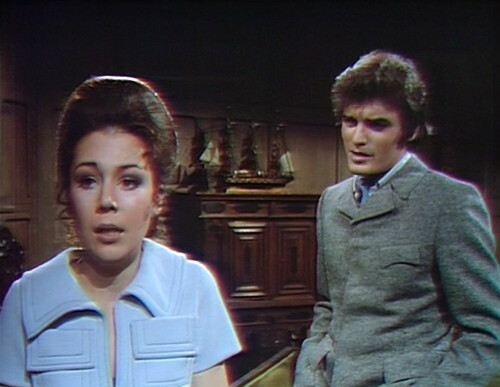 In two of those episodes, Barnabas, Quentin and Maggie don’t appear; it’s just Angelique vs the Leviathans. In the third episode, she has a scene with Barnabas and Quentin, but they don’t talk about Maggie, because they have other things on their minds. So this is a fleeting bit of visual spectacle, a chance for Quentin to remind everybody how seductive and romantic he is, before we move on to another storyline, featuring a different Quentin. The first time that Angelique pulled this stunt — making two acquaintances fall madly in love, with matching devil marks on their hands — it was a lot more consequential. In fact, it was a key factor in the destruction of the 1795 Collins family, permanently altering the direction of the show. In 1795, Josette hooking up with Barnabas’ beloved uncle Jeremiah was the most explosive thing that could possibly happen. 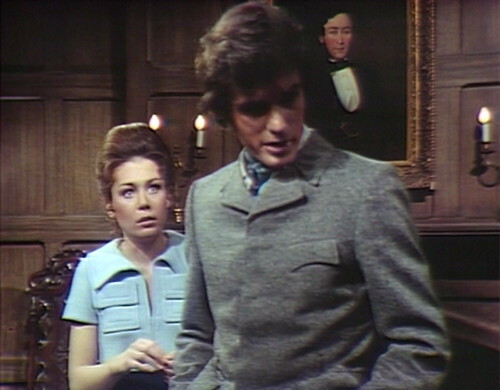 The storyline hinged on the tangled love triangle between Barnabas, Josette and Angelique, and for a while, that was all anybody on the show talked about. But Angelique’s love spell sent Josette into Jeremiah’s arms, crushing Barnabas and Josette’s wedding plans. Anguished and confused, Barnabas killed Jeremiah in a duel, and then married Angelique. Then, when it looked like he was turning back towards Josette, Angelique killed him and turned him into a vampire, and then she chased Josette off a cliff, to a messy death on the rocks below. That is the beginning of the story that we call Dark Shadows. This one simple trick shattered Barnabas’ life, and profoundly altered the future destiny of the Collins family. Losing Barnabas and Jeremiah wiped out the male lineage of their branch of the family, and they had to import another Collins from New York just to keep the name going, because they’d already called this enormous mansion Collinwood, and they couldn’t afford to change all the letterhead. But reprising the story point now with Quentin and Maggie has absolutely no impact on any storyline, including their own. 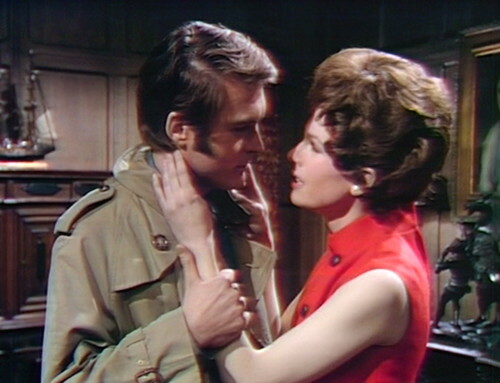 Conceptually, a mixed-doubles triangle between Maggie, Barnabas, Quentin and Angelique could impact their struggle against the Leviathans — for example, eroding Barnabas’ trust in Quentin at a critical moment, or sending Angelique spinning into a partnership with Nicholas — except it doesn’t, because nobody really cares about Barnabas and Maggie’s relationship. This is an action-adventure storyline, a war between rival factions, and we’re barreling towards a climax. Everyone’s attention is focused on the oncoming storm. Then there’s some more discussion about the way we feel, touching on the following points: it makes Maggie feel disloyal, it makes Quentin feel protective, and we couldn’t fight it, even if we wanted to. That is the latest update on the way we feel. This is actually a serious problem, at this point in the series, and I want to flag it as a factor in the ongoing investigation into Who Killed Dark Shadows. The 1897 storyline, which concluded a few months ago, was mostly driven by romantic relationships. There was a grand total of six women who had a romantic connection with Quentin — Beth, Jenny, Laura, Angelique, Pansy and Amanda — and each of those relationships moved the story forward. But coming back to 1970, it feels like somebody turned down the “love story” dial. There’s the relationship between Carolyn and Jeb, of course, which is pivotal, but everything else is just background filler, including this tepid Barnabas/Maggie/Angelique triangle that blows over almost as soon as it starts. Instead of telling love stories and building couples that the audience cares about, the show is putting that energy into a detailed analysis of all the conspiracy-related relationships. When will Jeb discover that Barnabas is a traitor? Is Philip’s faith in the Leviathans weakening? Does Megan’s devotion to the cause make her restless? Does Elizabeth feel left out of the inner circle? Is Bruno loyal to Jeb, or Nicholas? In fact, by the end of the week, they’re going to do a series of scenes examining how Bruno feels about Jeb, and the Leviathans in general. They construct a compelling arc for Bruno — a character who we do not care about — but they don’t have time to give us a clear reason why Maggie is suddenly a romantic option for Barnabas. Also, a few episodes from now, they shove Chris and Sabrina back together, which just makes me despair. I might as well talk about it now, because I don’t really want to discuss it later, so here’s the deal: Sabrina is the lady in the wheelchair. A couple years ago, she saw her boyfriend Chris turn into a werewolf, which was such a shock that her hair turned gray and stringy, and she lost both the power of speech and her gross motor skills. But they’ve decided, now that Carolyn is with Jeb, leaving Chris at a loose end, that they might as well drag Sabrina out of the chair, and take over Carolyn’s role in the werewolf story. So all of a sudden, Carolyn is transporting Sabrina to the beauty parlor for a makeover, and they come back with Sabrina’s gray crone hair transformed into an actual brunette hairstyle. This means that her trauma is over, and Chris and Sabrina are in love again. Carolyn was the person who made the werewolf story matter; that was Chris’ real connection with Collinwood. When Chris turned into a werewolf, it was upsetting for everyone, including his sister Amy, but the main point of the story was that Carolyn was in danger. Now that Carolyn isn’t involved with Chris anymore, there’s no reason for Chris and Sabrina to stage this reunion in the Collinwood drawing room, and this whole storyline peninsula could break off and separate from the mainland completely. In fact, as of this week, it’s possible for them to say “Chris, Sabrina and Amy decided to leave town while you weren’t looking, now they’re gone and they didn’t say goodbye, and you’ll never know how it all works out.” And that’s what happens, eventually. While we’ve been discussing all this, the magic potion has worn off, leaving Quentin and Maggie stranded in the middle of a party they didn’t want to attend. “It’s strange,” he says, and she says, “What is?” And he says, “Nothing,” so she says, “You must have meant something,” and he shouts, “But I said nothing!” This is how people talk when they’re not in love with each other. “It’s over, isn’t it?” she observes. “So quickly. You don’t feel the way you did a few minutes ago, do you?” He doesn’t. This is the existential emptiness of random soap opera matchmaking, where they pair people up who have nothing in common — like Eve and Peter, for instance, or Nicholas and Maggie, or Barnabas and Maggie — and insist that they have feelings for each other. If I didn’t know better, I would suspect that Sam Hall is using this story point as a satirical meta-joke, poking fun at the cursory amount of effort they’ve been putting into setting up couples in the present-day storylines. So Maggie says, “Let’s not talk about it anymore,” and he agrees. He says good night, and walks out the door, leaving Maggie to ask herself: Is there anything I could have done differently? Tomorrow: The Sad Song of Sue Agatha. In the reprise, Quentin and Maggie are lit by firelight, as they were at the end of the last episode. Then there’s the opening theme, and when we come back from the titles, the drawing room is lit normally, and there’s no fire. Liz brings Amy in the house and appears to close the doors, but when we cut to the foyer, one of the doors is still open. In the very last shot, as the camera pulls back from Willie and Maggie, you can see the boom mic overhead. The Petofi box will not be ignored. It’s in the hallway when Willie sneaks in through the window, and looks for Maggie’s room. Act 3 opens with a tight close-up on my favorite prop, the Ralston-Purina lamp. 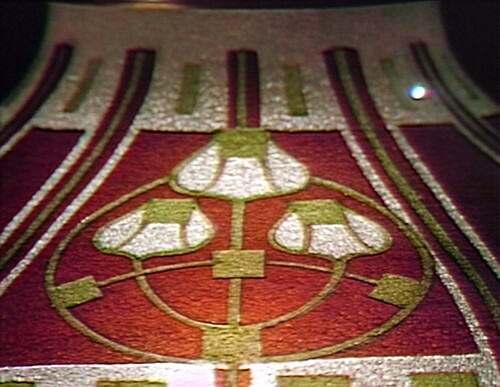 This is the second Ralston-Purina close-up in a week, the last one was in episode 953. Apparently, I’m not the only person who thinks highly of this lamp. As I was reading through this, something occurred to me, about halfway down — specifically once I saw the flashback image of Josette and Jeremiah — then when I scrolled back up to the top to check the episode writer’s name I thought, Ah hah! Is it specifically Sam Hall who keeps recycling and revisiting these 1795-era story points? Was it his doing to have Barnabas travel from 1897 back to 1969 via 1796 (or 7)? And what about the return to 1796 before that? Was that Sam Hall as well? Going back to 1796 to save Vicki was mostly Sproat. The post-1897 transition episodes were Sam Hall. I find that discussing things from the standpoint of the writing is interesting, in terms of character arcs. Vicki was the protagonist when Sproat joined in 1966, so I suppose it makes sense that he would have a large hand in wrapping up her story. But isn’t it true that Angelique was the creation of Sam Hall? It also seems that the “dumbing down” of Victoria Winters occurs as the 1795 story gets underway (which is around the point where Hall arrives), where the character becomes a background player in her own time travel story and is no longer portrayed as smart, assertive and savvy the way she was in 1966 to 1967. Instead, 1795 becomes all about Angelique and her conflict with the Collins family and, in particular, Barnabas. In any event, the pairing of Barnabas/Angelique is perhaps the most believable and heartfelt of any in the entire run of the series. Agh! He killed her! Not being involved in the show from the start, how could he understand how annoying that would be for those who had watched from the start? How much oversight did/was Dan Curtis exercise at this point? It does seem that plots are being chucked into the pot like leftovers, in hopes of cooking up something palatable. And since the 1795/6/7 storyline had done well in the ratings, those were the bits they fell back to. Find another Trask, and wall him up, why dontcha? But really, why bother with the love hex, anyway? I know Angelique usually came round the long way with her spells, but this one is pointless. Just turn Maggie into a cat. Better yet, make her remember all that Barnabas did when he kidnapped her and tried to make her into Josette. THAT would get some plot cooking! And the Carolyn/Jeb affair reminds me very much of the stuff they were doing on ST:TNG with Riker, where he seemed to fall madly in love every other week. For about an hour. Absolutely. Now THAT I would’ve loved to see. All hell would’ve broken loose. Perhaps they were too afraid of the repercussions of having everyone finding out Barnabas was responsible for all that…but surely he would’ve had a lot of loyalists trying to fight it. And the story would’ve then branched off in all sorts of new directions. Love this too, by the way: “Wonder if Sky’s found someone else yet? (I always found it interesting that he was rooming with Bruno in later episodes…just sayin’. They’re just Levia-friends? )” – yeeeeesssss. Also, by the way, I can’t stand that dress Maggie has on! I think it’s my most hated DS outift. Everything that was wrong about the 70s. Not too mad about the frock we first see Angelique Rumson in, either, back in episode 924. Maybe it’s the light blueness of them. Or do we expect too much from Ohrbachs? And we must not forget the quilt thing that Maggie occasionally sported, or a certain skirt that Carolyn sometimes pulls from her wardrobe (which I said I wouldn’t mention again). And while we’re on the subject, Liz has that gold number with the padded doughnut collar that looks like she has a neck brace, for the ‘1795 seance’. Danny has already spoken about the men’s fashions, I can only second the sentiment about the dearth of shirtless guys during the Leviathan plot (Geoffrey Scott never ONCE changed out of that suit & tie. Would it have been too much to ask to have had that on screen instead of some boring fishbowl recap of the previous episode? I think not). My sister and I took to calling those episodes “The one where Riker gets the Prime Directive caught in his zipper,” but after a while, that just got more confusing. The Quentin and Maggie relationship reminds me of my complaint about Angelique as Cassandra. It was stated that she had placed a spell on Roger so that he’d impulsively marry her. Now, while Lara Parker might have needed magic to compel the romantic attention of Louis Edmonds, there was no reason for an external cause for Roger’s mid-life crisis. Angelique, as Cassandra, could have easily seduced Roger by, you know, smiling at him. And that would prove a far more compelling story point. He would be torn between the woman he loves and his family. Quentin and Maggie, meanwhile, are both gorgeous young people and the audience would have bought a “forbidden love/romantic chemistry” storyline between them. Having Angelique force them together (and not especially effectively) is not good story telling. It’s already been discussed that Barnabas and Maggie neither make sense as a couple nor have any chemistry between them. Barnabas is the show’s leading man, and Maggie is arguably the show’s leading lady, so a match makes sense. It just doesn’t work. It’s another example of the show playing Maggie as if she’s Vicki (who also never had any romantic chemistry with Barnabas but at least they liked old books). Vicki and Barnabas both loved “The Past”, as well – though Vicki had a rather incomplete understanding of the specifics of “The Past” until she got there. I often wonder what she taught little Sarah when she was a governess back in 1795…maybe she just stuck with reading and writing, and maybe some watercolor art (after all, Sarah was ‘only a girl’, with no need to learn about arithmetic or history or geography or – well anything else but landing a rich husband). You’re so right Stephen. 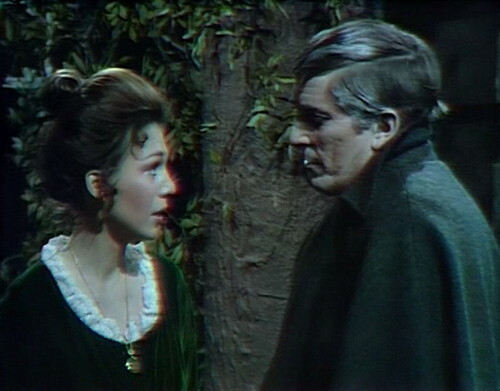 But I found Barnabas/Maggie (what was it? Baggie?) did have more than zero chemistry (as Barnabas and Josette at least; admittedly not as much as Barnabas and Angelique, but a different sort that to Barnabas did rival his connection to Angelique) – to me, what was so artificial about Barnabas with later Maggie, or Victoria, (or Roxanne) was that if he was so damn obsessed with Josette, replacements just wouldn’t do! He would fixate on one replacement Josette (Maggie – and at least she looked exactly the same as Josette), and nothing else would do. But as soon as it doesn’t work out, he switches to Victoria. It doesn’t make any sense! Now Victoria is gone and it’s back to Maggie again (especially after the Kitty Hampshire incident). Later he randomly falls in love with Roxanne. Not very good at being obsessed with someone is he? If you’re going to run the story that he is obsessed with his lost love and that is a main feature of his character, stick with it, damn it! If they had taken this line, then had Maggie falling in love with Quentin of her own accord, it would’ve annoyed the hell out of Barnabas. Couldn’t they really find anything else for Angelique to do? I mean at the least, she would be totally annoyed that Barnabas was still obsessed with Josette and going crazy about her liking some other guy. Then what if she voluntarily joined the Leviathan side or something? Or tried to steal Quentin from Maggie only to dump him again? I dunno, The world was their oyster (the DS writers). Maybe they had lost their will to live with this by now. Were they still writing the movie at this stage? Victoria didn’t look exactly like Josette, but her personality was similar. More similar than Original Maggie’s, anyway. That’s it. Now that Angelique is a witch again, she has to do some magic spells, cause that’s what witches do. A spell of no consequence, the witch equivalent of flashing your I.D. Back in 1795 (geez, it seems like about 222 years ago!) Angelique’s husband and love of her life tried to kill her, and how did she react? She called a flappy bat from Hades, which he pretended to wrestle with and get vampirized by! Eternal damnation, that’s how she dealt with it! And now, when Angelique’s husband and love of her life tries to kill her, how does she react? Nothing. Nada! Zip! Zilch! Revenge on Sky Rumson would have been a great way to show off Angie’s witchin’. Maybe a smushface, a la Evan Hanley…or turn him into a wombat…perhaps a love spell to make him fall madly in love with Jeb…could make him obsess about his own death…even sic a Dream Curse on him…but he gets off without even a pin in his voodoo doll. What happened, Angelique? You used to be SUCH a serious biz-z-otch! That’s right – Maggie and Quentin are both beautiful and got pent up sexual energy just waitin to be burned. It didn’t take an Angelique spell to force them into a heated embrace but once the spark was lit, they wouldn’t have pulled away like a couple of guilty cheaters. Maggie is SO ashamed and Quentin acts positively repulsed. The only thing missing is for him to try to slip her a $50. The Quentin/Maggie pairing is gratuitous to the kids outside the studio doors. It’s a boring pairing, even more so than Jerimiah(sp?) and Josette. An “I’m such a sensitive guy” style character. Ugh. Dan Curtis clearly also told them what he wanted in a general sense – for example, he told them they were going to have a vampire on the show. The writers didn’t come up with that, then he approved it. But when they started making the movies, apparently he lost interest, though I don’t believe he got totally disengaged with the show until later, when Lela Swift started being credited as producer. Chris may not be taking his shirts off, but at least he still wears them half-buttoned. He’s trying, bless his tousled little heart. But why? Not long ago, Dark Shadows knew that their hot guys were made of meat. They just seem to have forgotten it after Joe is straitjacketed. Was it chauvanism on the part of the male writers? The shirtless shows were mostly Ron Sproat, anyhow; which (for me (and perhaps some others?)) is to his credit. At least he got THAT bit right. Oh, I never thought of that! Yeah, maybe Sproat was responsible for all the taking-off-shirts activity. I should’ve been nicer to him. Yeah, sexist me, initially I assumed it was Violet Welles, but she didn’t (officially) sign on until later.